Map Showing Location of Champlain and Sandford R.R. 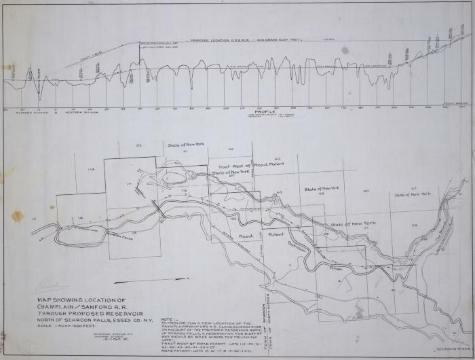 Through Proposed Proposed Reservoir North of Schroon Falls, Essex Co. N.Y., Essex Co. N.Y.
Map and profile showing location of proposed dam and dyke north of Schroon Falls, in the Adirondack Mountains. If dam was built, the railroad would have to move its tracks, as the dam would involve land occupied by the railroad. Scale one inch equals one thousand feet. Source: Adirondack Museum Library, MacIntyre Iron Works records, MS 65-27, box 4, no. 23.